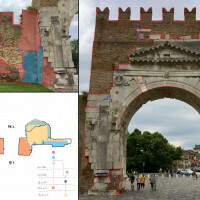 Since 2017, a new research project has been undertaken by the University of Bologna on Urban Archeology in Rimini, as part of an agreement with the Soprintendenza Archeologia, Belle Arti e Paesaggio per le Province di Ravenna, Forlì-Cesena e Rimini. This project is an integrated study with academic aims that hopes to produce a map of the archeological evidence of the city. 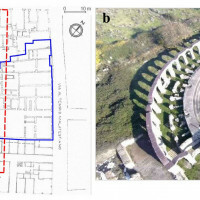 In the first phase of work, which is still ongoing, the researchers have been focused on the architectonic study of some important monuments of the Roman city which are still part of the current urban landscape, such as the Theater, the Amphitheater, Tiberius’s Bridge and the so-called Arch of Augustus. 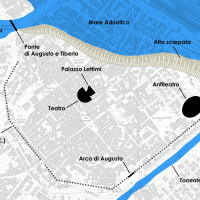 In 2017, an agreement was signed between the Soprintendenza Archeologia, Belle Arti e Paesaggio per le Province di Ravenna, Forlì-Cesena e Rimini and the Department of History, Culture and Civilizations of the University of Bologna to start a research program on the urban layout in its various historic phases in agreement with the Municipality of Rimini. 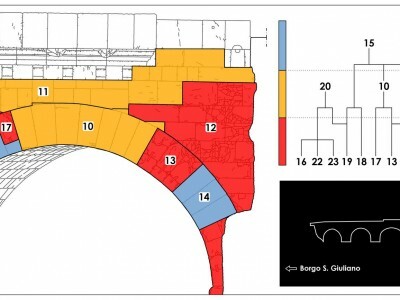 The result of this synergy among the research, safeguarding, promoting and governing entities of this area is a project of Urban Archeology that brings together several investigative methods in order to reach an evaluation of the archeological potential of the historic center in Rimini through a map of the possible buried archeological remains and the study of the main architectonic complexes and of the city. These goals have been pursued using traditional methods, such as analyzing bibliographic and archival documents, but also thanks to the gathering of new data in the field with more innovative methods, as part of some academic internships held in the spring of 2017 and 2018. These internships are experiences that are part of the workshops of Geophysics, Topography and Building Archeology at the University of Bologna and they use 3D laser scanning, Close Range Photogrammetry (CRP), and Ground Penetrating (GPR) Radar . The data gathered should contribute to clarify the main changes in the urban fabric of Rimini and will be managed and analyzed using a GIS platform, which will use the archeological map already provided by the Municipality of Rimini but also it should enable the sharing of knowledge among all the entities involved. As stated, the project is also a learning opportunity in the field and in the lab. 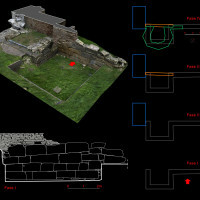 The learning outcome is to put students in touch with the problems of archeological documentation in multi-layered settings, such as an urban center that has been continuously inhabited, through the use of advanced methods and instruments which are also useful in the professional growth of the students. The first two years of research have been dedicated to the study of the most famous archeological monuments of the Roman city of the imperial period, built as part of a wider program of urban renewal of the ancient Latin colony of Ariminum: the Arch of Augustus (27 BC); the Bridge of Tiberius and Augustus (14-21 AD); the Theater (1st century BC) and the Amphitheater (2nd century BC) (fig. 1, fig. 2) . They are, in general, structures of extraordinary architectonic value which have been exceptionally preserved, with the exception of the Theater, of which there are only a few bits of the walls which have been incorporated into modern buildings. Research was also done on Palazzo Lettimi: a Renaissance building, commissioned by the Maschi family next to the Roman Theater, presumably on preexisting medieval remains . The choice of this building, which gets its name from Andrea Lettimi, who owned it in 1770, was made as it meets the contingent need to prepare a design for the functional conversion of this site while respecting its architectonic and archeological features. In this regards, the aim is to provide a preview, absolutely preliminary in nature, of the early phases of this still ongoing project. The remains of Palazzo Lettimi are located to the North of Piazza Tre Martiri, where the Forum of the Roman city used to be, and they are currently covered by an area of vegetation (fig. 3). The complex takes up about 1600 sq.m of space and is surrounded by perimeter walls and other more recent buildings. The façade of the entrance faces North-East, and about 30 meters in length and maximum 11 m in height have been preserved in the area of the left corner, which then abruptly deteriorates up to about 5 m from the road (fig. 4). The outer masonry, in heterogeneous bricks both in color and size, has no plaster. 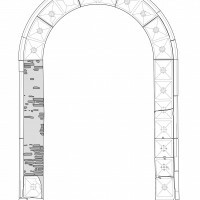 The quoins, the openings and the decorative elements are instead made with stone materials. In the wall there is a portal and four windows; one of the more recent ones has been closed up. The lower scarp wall of the building is made of bricks and supports a stone stringcourse made up of elements carved with a rope motif. To the right of the gate, under the windows, there is a smaller opening which probably allowed light and air to enter the basement rooms. The bibliographic and archival study has provided a rather articulate overview of the building’s history, even if there are still some unresolved problems. 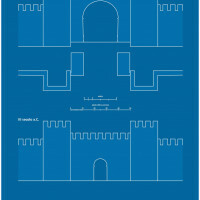 With our current knowledge, for example, it is not possible to specify the shape and exact dimensions of the original structure, even if some traces of the first architectonic layout and of some later modifications can still be inferred from the surviving walls and in particular from the main façade. 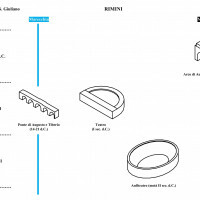 Some measurements of the building materials are still in progress as well as of the architectonic elements and of the floor plan to verify if there is a correspondence in dimension with the walled 16th century abacus in the Loggia of Palazzo dell’Arengo, which shows the units of local measurement and the fixed dimensions for some construction materials (fig. 5). Another question, which needs an answer, regards the three preserved windows in the façade: are they all from the same building phase? In fact, there are some differences in their construction which deserve future examination. The frieze, despite its advanced stage of deterioration, is the most interesting element. Here there is a precise clue about the identity of the commissioners: the noble crest of the Maschi family (fig. 6). As for the entrance portal, it is a work of top quality, made with ornate elements using a bossage (carved into a diamond point). Similar works – of which their chronology is known (end of the 15th-16th century) – can be seen in the city and in other towns in Romagna (fig. 7). Another aspect to clarify regards the origin of the palace: was it a new building or was it built by adapting and enlarging preexisting structures? The question is legitimate because the written sources suggest the presence in this same area of older buildings owned by the same family. The Maschi family lived from the end of the first half of the 15th century in the area where the palace in question can be found today, but the hypothesis of a restructuring of preexisting buildings should be supported by archeological evidence. From the archival documents we know that in 1513 Carlo Maschi financed the works for the building of a fabrica (May 20) and for the rebuilding (redificat) of a domus (August 25). At the end of the year, the works had not yet been finished, however, from this moment on, when referring to the Rimini abode of the Maschi family, the term palatio was used instead of domus. Lastly, from a document dated December 24, another piece of important information can be taken: the area of the palace being built was occupied by preexisting living structures . Regarding the chronology of the structures preserved above ground, an analysis of the architectonic features suggests dating them to a time somewhere between the 15th and the 16th centuries. Confirming this theory, let us be reminded that the first certain news about the works commissioned by the Maschi family date back to the beginning of the 16th century. Furthermore, from the available documentation direct references to the type of work emerge, the partial rebuilding of what existed, and the setting up of the construction site in the neighborhood of Santa Croce. 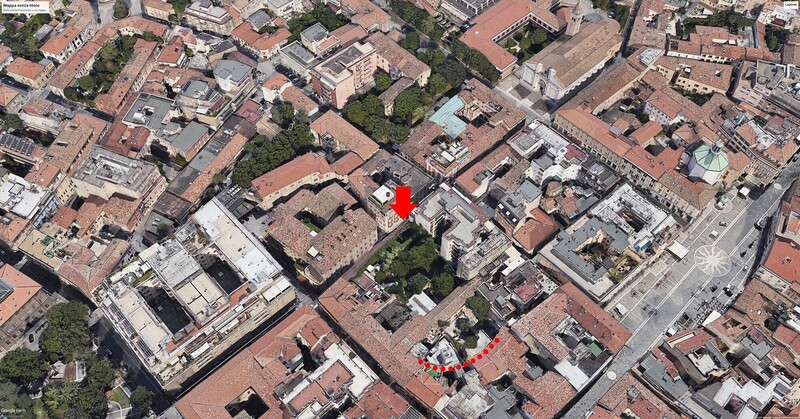 In fact, this area of the city takes its name from the Santa Croce church which can be found nearby. The building, now deconsecrated, is also known by the name of Oratorio della Crocina . But the building history of this swatch of the city is interwoven also with that of the Roman Theater, found nearby at the end of the 1950s, after a study of the cartography and aerial photos. In fact, near to Palazzo Lettimi, the curved profile of the buildings sticks out as an anomaly, evidently conditioned by the persistence of the underground remains of the Theater. Remains of a stone wall which have survived up to the height of the first floor, and most likely the radius supporting walls of the cavea, have been identified in a house in Via Giordano Bruno. The archeological confirmation then came in the summer of 1961, thanks to the digs for the construction of a building located on the corner of Via Mentana and Via Del Tempio Malatestiano, when architectonic elements were found. A second dig, carried out in the fall of 1961 on the corner between Corso d’Augusto and Via Giordano Bruno, brought to light some curved walls that supported the cavea, dating to the 1st century AD. The chronology was confirmed in 1989, thanks to the study of numerous ceramic remains and to the discovery, again in Via Giordano Bruno, of another wall section belonging to the theater construction. Probably, as with other Italian theaters, its construction was begun in the Augustan era (31 BC – 14 AD) and completed in the Tiberian era (14-37 AD) while work was taking place on the nearby bridge . Also the study of this building is in a preliminary phase of preparing its documentation. 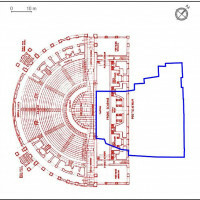 Some interesting suggestions, useful for the development of future research, can be gleaned from the observation of the floor plan which highlights the possible spatial relationship between the Renaissance palace and the volume of the Roman building, reconstructed on the basis of comparisons with other theaters similar in dimension and timeframe (fig. 8, fig. 9). 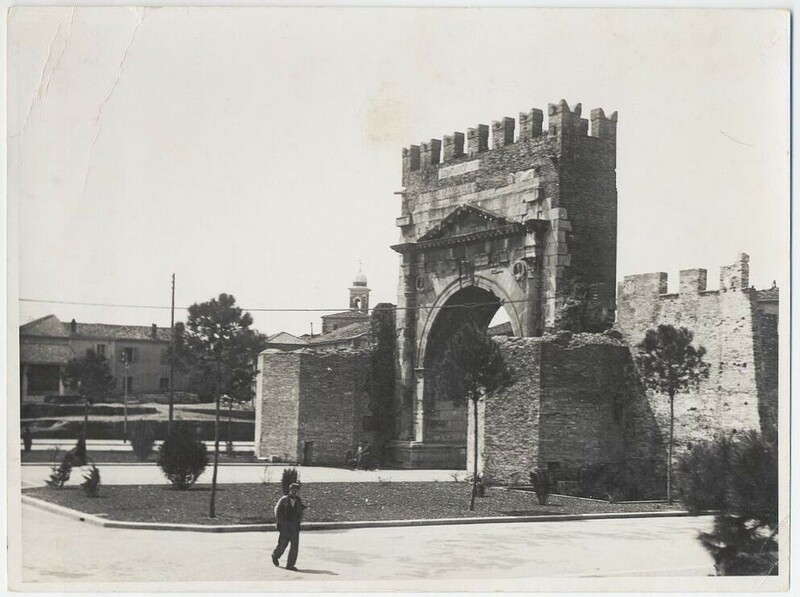 The arch was constructed in 27 BC, where the Via Flaminia reached the city, for celebrative reasons but also to improve the urban decor in substitution of the original city gate, dating to the same era as the city limits. The monument today sits in an isolated position, in the middle of an empty urban space caused by the surrounding houses and other structures. Over time, it became isolated and lost its original urban connotation, while in its origins it was surely connected solidly with the city walls and was probably located along the perimeter of the pomerium . The arch has a single fornix and a noteworthy façade, 19 m high and 15 m wide, with square shaped rubble masonry: the center is made up of rocks, fragments of stones and pebbles stuck together with mortar; the external covering is done in white Istria limestone). At the top there is a battlement in stones built in line with the wall. Some battlements have certainly been restored, while the oldest ones probably date back to the 13th century. In that period a municipal seal was created, which shows the bridge and the arch. 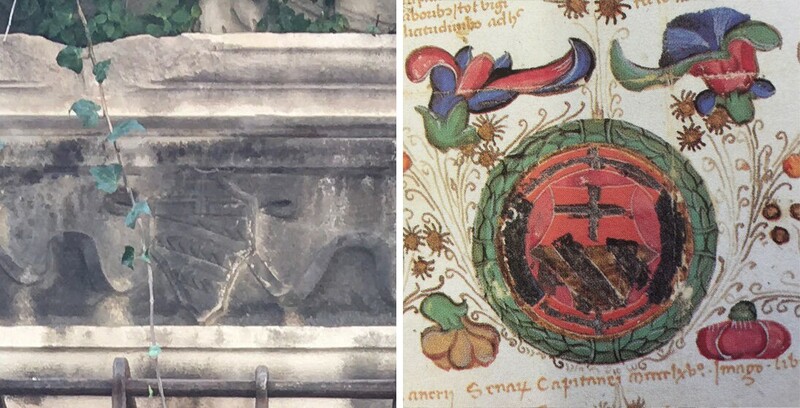 In the image the battlement can clearly be seen outlining the upper margin of the monument. Evidently before the 13th century the original top was already falling into ruin and it was necessary to restore it to stop the deterioration from spreading to the lower parts. At the foot of the monument there is a multi-layered context of great interest which begins with the remains of the Republican era wall of Ariminum and covers a wide timeframe that reaches up to its demolition in the 1930s . The current state of the monument is the result of a long sequence of building interventions and despite its 2000 years it is still overall in a state of total static safety . From May 8 to 12, 2017, the area around the gate, where the remains of the domus had already been located, was investigated using geophysics and at the same time archeological analyses were carried out on the structures above ground (stratigraphy and architectural techniques) and the operations of topographic measurement were done (photogrammetry and laser scanner) (fig. 10) . Based on the stratigraphic observations and keeping in mind the recent archeological investigations, we can attempt an overarching interpretation of the main transformations of this monument. The walls and the towers built in yellow sandstone belong to the first building phase of the 3rd century BC (Republican/Colonial era). The second phase is the more monumental one and concerns the gate in white limestone dedicated to Augustus (27 BC). In the third building phase (Aurelian/late imperial age) there are the stone walls, outfitted with drainage arches, built in the 3rd century AD above the colonial towers (which were already in disuse at that time). The fourth and final phase (late antiquity or medieval era) includes the seven sided towers built of stone and that took the place of the ancient colonial towers (fig. 11, fig. 12). The dating of the various phases is based on some elements which can be categorized as follows. 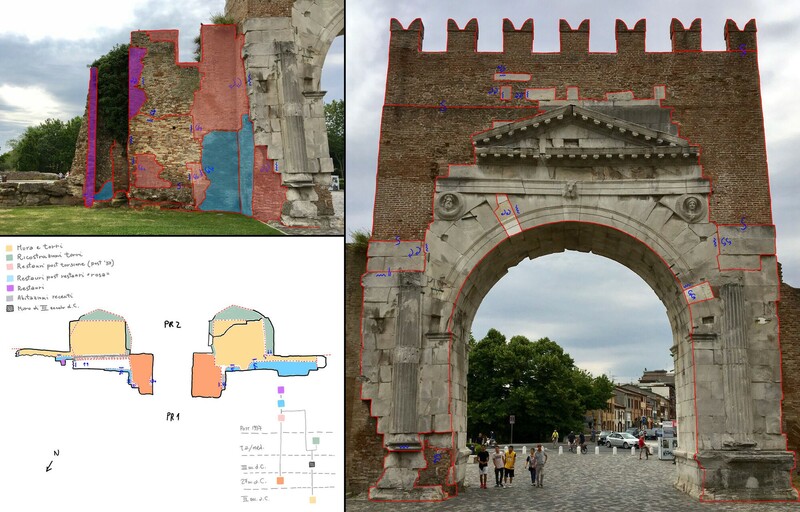 Phase 1 – The dating to the 3rd century BC of the urban walls was put forth in the 1980s following a survey and digs carried out near the arch where some very legible coins were found. Furthermore, the bricklaying technique is similar to that of other structures built in the mid-Republican era in the Etruscan-Latin area, from which it is likely the manual labor used came . Phase 2 – The year of its founding can be seen from the long epigraph, damaged in part, located at the top of the monument and put back together in 1912 during some restauration works. In 27 BC the ancient colonial gate (substantially still unknown) was knocked down and buried by a thick coating of cement conglomerate. 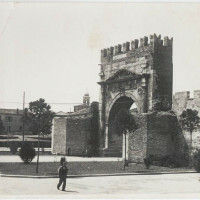 In this area, between the defensive towers (which were instead spared), a new celebrative monument was built which was also a city gate: the so-called Arch of Augustus . 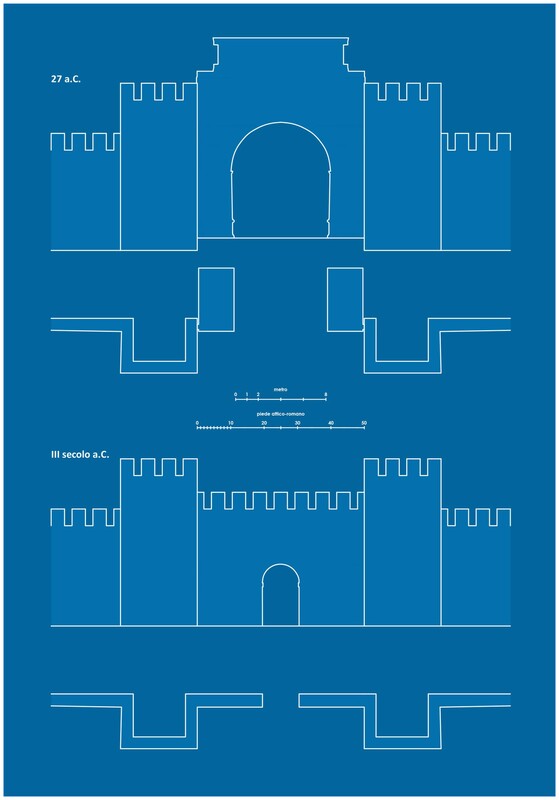 Phase 3 – Information regarding the building period of these walls can be obtained also based on a consideration of the stratigraphic features. The structures, which rest on the gate of Augustus and support the seven sided more recent towers, have a drainage arch built by placing standard bricks in a line and carving them out. The stones are 44-45cm long and 6-6.5cm wide. 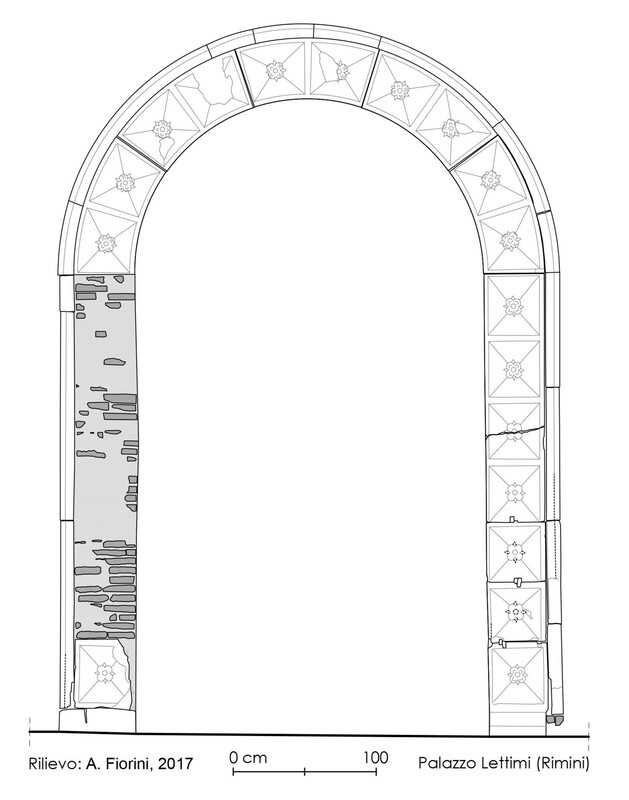 The same elements, but in a more or less fragmentary state, make up the outer covering around the drainage arch. This is the so-called “sesquipedalian” (sides equal to a foot and a half: 29.6 + 14.8 = 44.4 cm): a widespread sizing in many Italian cities starting in the late Republican era and especially in the early imperial age. Also in Rimini, for example, similar sized stones were used (44 x 29 x 6.5 cm) to build the Amphitheater in the second half of the 2nd century AD . Phase 4 – In late antiquity or the medieval era, in front of the gate, two new buildings with a polygonal (with 7 sides) shape were built. These structures, which take the place of the old colonial towers (phase 1), were built to support the Augustan gate (phase 2) and the late imperial walls (phase 3). A photo from the 1930s shows the two buildings still erect but already in an advanced state of structural deterioration (fig. 13). The towers had an outer wall casing in stone and a brick center made up of stone chippings mixed with mortar (cement). Unfortunately in 1938 it was decided that the towers be knocked down to give more value to the Augustan phase of the monument. Luckily on the left side of the north-eastern colonial tower there is still a small section of outer wall casing. This structure, about 70 cm high, is made from bricks with the exception of one reused architectonic element, possibly a shutter (shelf) or a cornice. The bricks are whole and of four different sizes: 1) 25.5-26 x 12.5-13 x 5.5-5.6 cm; 2) 29.5 x 8 cm; 3) 28.2-28.5 x 12.5-14.5 x 5.5-6 cm; 4) 43 x 29 x 7 cm. This material has been selected well and stripped from Roman ruins (sizing 4), then placed together with more recent bricks, possibly made for the occasion in the early medieval era (sizing 3). 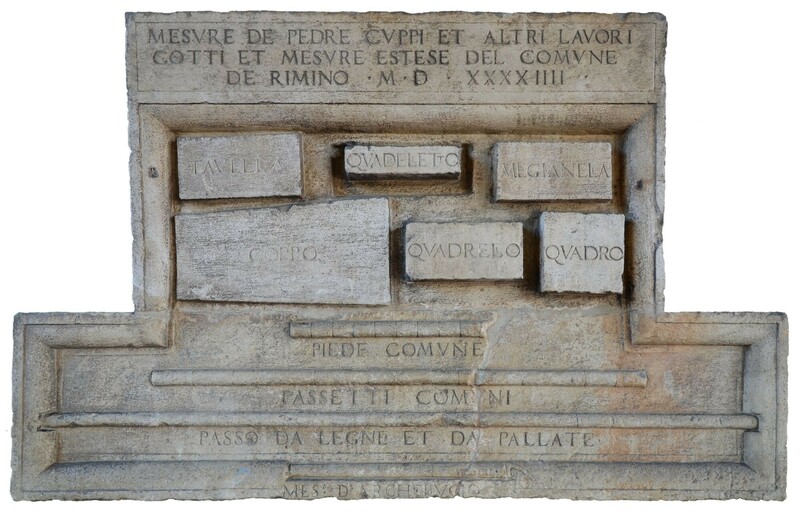 For the dimensions of the late 13th century bricks of Rimini there are two known examples that had the date 1281 carved into them before their baking. 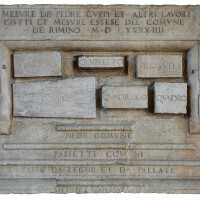 The bricks are housed at the City Museums of Rimini and the first is 28.7 x 12 x 5.3 cm (so completely compatible with sizing 3), the second 29.3 x 13.3 x 5.1 cm . The continuation of the investigations will allow us to be more precise about the chronology of this structure. According to Guido Achille Mansuelli, who examined the site before and during the works in 1937, the towers were built after the 3rd century AD (in the Aurelian/late imperial age), when the reinforcement and expansion of the city limits had already been completed. For others, these are late antiquity structures (4th – 7th century) or medieval . The bridge, commissioned by Augustus and built in the Tiberian era between 14 and 21 AD, as seen in the two twin engravings on the eastern and western ramparts, allowed for the river Ariminus (Marecchia) to be crossed and connected the suburban area to the historical city center . The bridge connected the suburban area to the historical city center, assuring continuity in the road: the Corso d’Augusto (the ancient decumano Massimo) and the Viale Tiberio (which in part coincides with the ancient Via Emilia and crosses through the Borgo S. Giuliano). Up until the 1920s, the Marecchia crossed under the bridge and curved to the right to then flow out into the Adriatic. The original course of the river can be deduced from a series of elements among which is the positioning of the pilings of the bridge. These structures, in fact, are not placed orthogonally to the street axis of the bridge but according to the direction of the river. The cut of the Marecchia and its deviation more towards the northwest, near San Giuliano a Mare, were necessary in order to eliminate the recurring floods the city was exposed to in particular Borgo San Giuliano. Today the final part of the Marecchia is a canal port which begins just upstream from the bridge. The Roman infrastructure is still in use and it appears to be in good condition. Its solidity depends on the noteworthy skill of the builders and the many restauration works undertaken over the years. The bridge is about 75 m long and consists of 5 arches resting on 4 pillars with rostrum upstream. The arches support a protruding cornice and on this rests a rampart with a round banister outline. The vehicle accessible part is slightly curved in a humpback. The masonry is square and filled with rubble masonry. The nucleus is made up of stones, rock fragments and pebbles held together with mortar. The wall casing is made up of ashlars obtained by squaring off white Istria limestone. The ashlars, which have an average width of 40 cm and a rectangular face, are positioned in straight rows, with variable cross placements which create an irregular weave . As noted, the bridge was essentially overlooking the sea and was in fact created taking into consideration the sea level of the time, which was much lower than today . So this means that today the water conceals a good part of the above ground structure, for about 4 meters, penalizing the monumental aspect of this building and naturally the archeological observations of it. The Romans placed the four vertical pillars that hold up the arches on stone bases which go down into the ground, with increasingly wide sections, until they penetrate the ancient seabed. Under the foundations they placed a thick foundation slab of wood which is in turn held up by a thick wooden piling in durmast oak (fig. 15) . 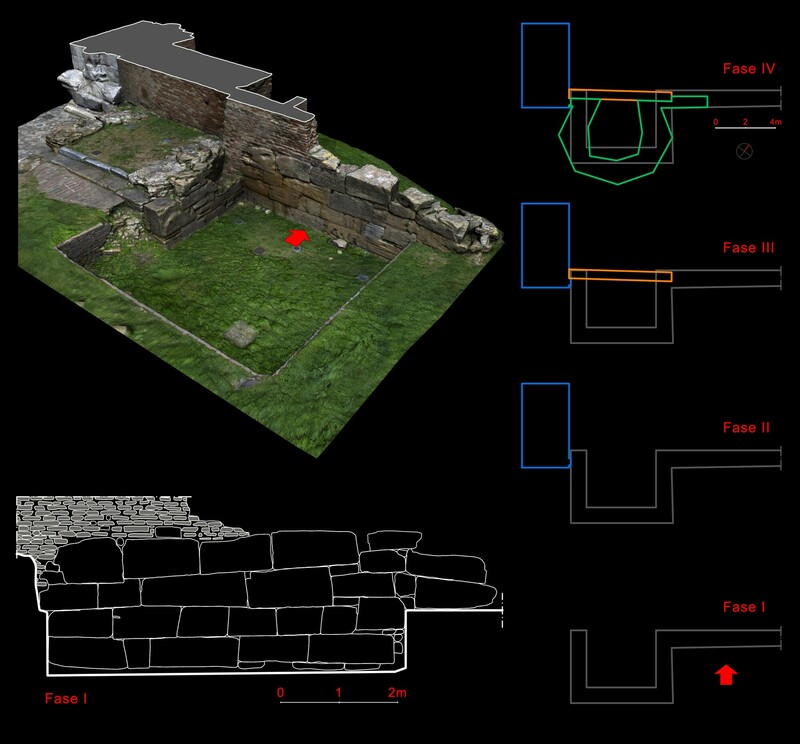 From May 14 to 18, 2018 the archeological investigations were carried out (analysis of the wall stratigraphy and the architectural techniques) and the survey of the structures above ground using a laser scanner. These analyses, integrated with the examination of the printed studies and the archival documentation, have allowed us to establish an absolute chronological order of the main transformations of the bridge. The data processing, the result of discussions among the students that participated in the academic activities, is still ongoing, however, the most evident interventions can be explained (the main turning points in its building history) and some approximate dates can be theorized for them (fig. 14). The bridge seems not to have undergone structural rebuilding with the exception of the first arch (on the side towards town). The intervention was done at the end of the 17th century under the supervision of Agostino Martinelli and it included the rebuilding of the rampart, of some elements of the arch and the rampart above the pillar (aedicule included). In fact, a aedicule cornice, possibly original, was found in 1989-1991 on the riverbed, right near the first arch facing Borgo di San Giuliano. 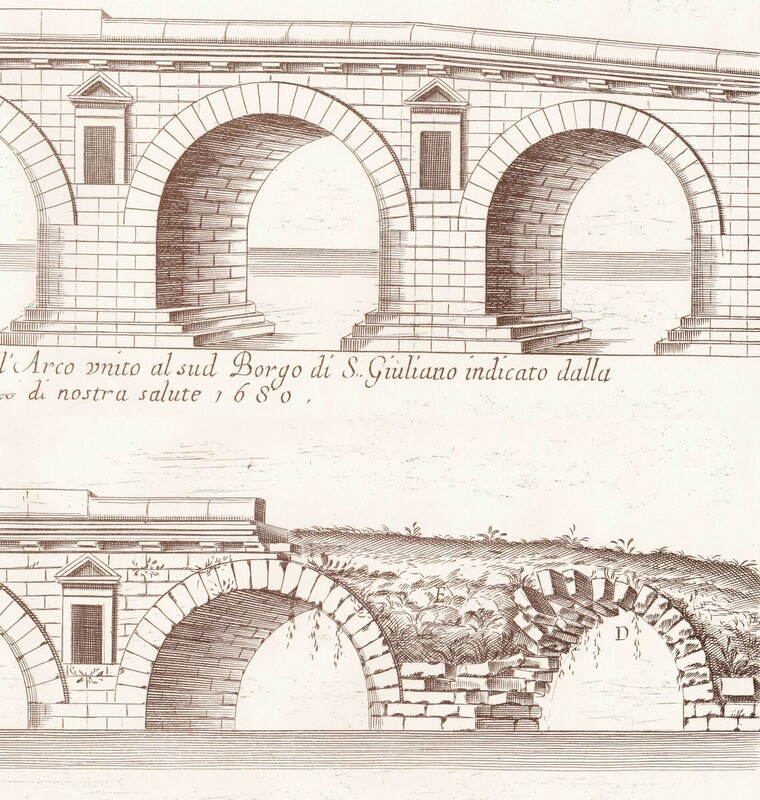 The state of the bridge, before and after the works of Martinelli, is well documented by an engraving from 1680 (fig. 16) . The other works, more numerous, affected the single ashlars of the outer casing, which, on more than one occasion, were substituted (when they had deteriorated) or restored (when they had fallen in the water). As a result, there is a commingling of different ashlars: in terms of wear, color (darker in the originals) and in the surface grain (finer and without macrofossils in the restorative elements) (fig. 17). 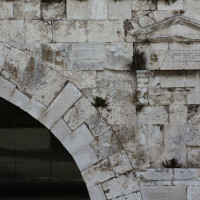 The time in which the restorations were carried out cannot always be specified, however, some of them can be dated by wall inscriptions on the bridge (the most notable is that of 1735: RESTAV. A.D. MDCCXXXV). 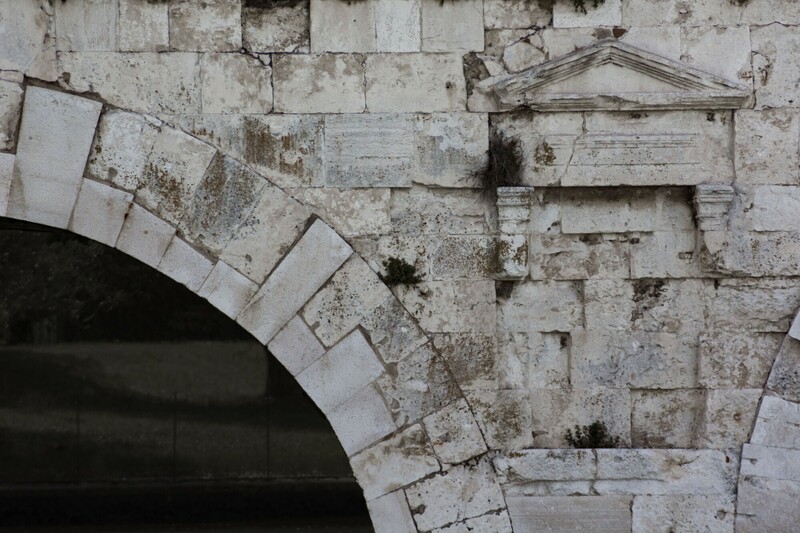 At the end of the bridge, in the direction of the city, there are two visible wall sections in stone which, presumably, indicate the insertion point of an entrance tower (called Porta di San Pietro, or Saint Peter’s Gate) (fig. 19). This structure, which had a crenellated crowning, can be easily seen in the Formella del Cancro: a marble bas-relief made around 1454 and housed in the Tempio Malatestiano in Rimini (fig. 18). 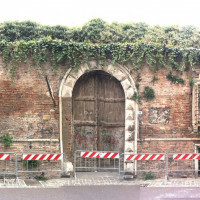 It is likely that the medieval building replaced an earlier gate from the Roman era but at the moment there is no archeological data available to support such a hypothesis. The figurative sources show the continued mutation of this military building until its total demolition in the 19th century. The Amphitheater of Rimini was the last of the big public buildings erected in the imperial period. A coin of the emperor Hadrian, found in the mortar of its walls, dates the construction to the mid-2nd century AD. The monument was built, near the coast, in a defense area (ostensibly) with walls from the Sulla era (in the first fifty years of the 1st century BC). The Amphitheater had an elliptical structure (of about 118 x 88 m) of which the ruins still remain today. The walls had a nucleus made of cement conglomerate and the wall casings in stone. A lattice of radial and concentric substructures, crossed by ambulacra and staircases, held up the terraces that looked out over the arena. The double layered external facade, the lower one of which was colonnaded, presented a series of arches framed by Tuscan order pilaster strips which held up an engrailed trabeation . From May 14 to 18, 2018 the surveys on the above ground structures (photogrammetry and laser scanner) were carried out and at the same time the geophysical surveys of the surrounding areas were done while the study of the building is still ongoing. Fig. 1. Reconstruction of the ancient topography with pinpointing of the sites studied in the years 2017-18. Fig. 11. Arch of Augustus (external facade, northeastern sector). Figure that illustrates the results of the investigation (developed by A. Fiorini, with the collaboration of Francesco Fontani). Fig. 18. 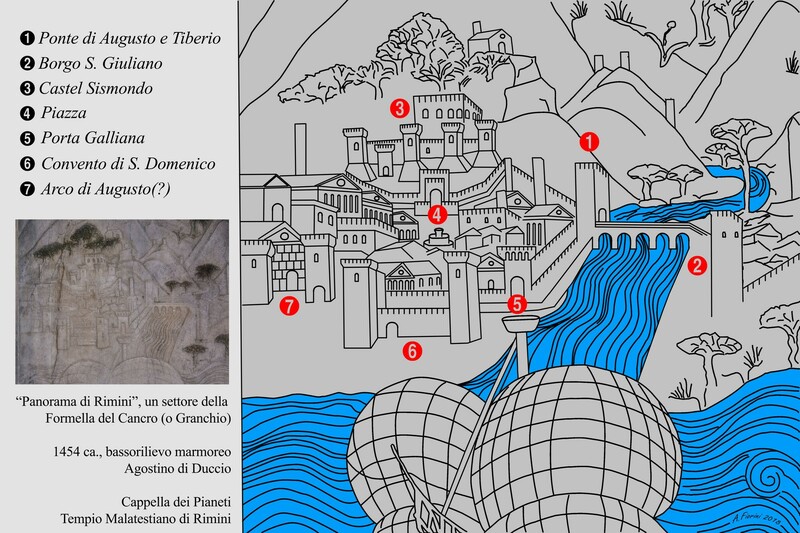 The first detailed depiction of the bridge is a marble bas-relief housed inside the Tempio Malatestiano in Rimini. It is called the “Panorama of Rimini” a section of the Formella del Cancro (or Granchio) which decorates the Chapel of the Planets. The bas-relief was done in 1454 by Agostino di Duccio. Fig. 17. Bridge of Augustus and Tiberius. A detail of the external wall casing. The lighter color ashlars are evidently the ones that were restored and have the mark of R 1976. Fig. 16. Bridge of Augustus and Tiberius. 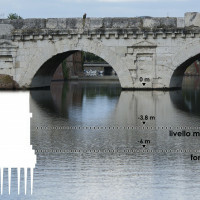 The status of the bridge before and after the 17th century restorations. Engraving by M.A. Marinario in 1680 (detail) (from Brigliadori 2006, document n° 98). Fig. 15. Bridge of Augustus and Tiberius. Study of the ancient levels of the riverbed and of the waterline. Fig. 14. Bridge of Augustus and Tiberius. The building phases identified as part of the learning lab activities (May 14-18, 2018). Fig. 12. Arch of Augustus. Graphic reconstruction of the external facade in the 3rd century BC and in 27 BC. Fig. 10. Arch of Augustus. Stratigraphic annotations recorded in the field using a PC tablet. Fig. 2. 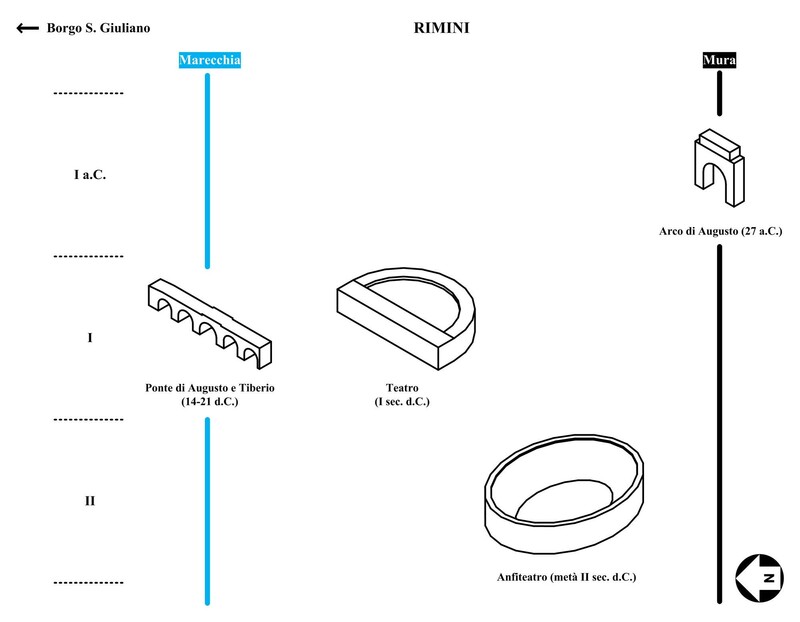 Buildings in the Roman imperial era of Rimini. Fig. 9. Palazzo Lettimi. In blue, the outline of the surface area of the Renaissance building. In red the Roman theater of Ferento (Viterbo, VT) resized based on the known structure of the theater of Rimini (developed by Pensabene 1989, 14, fig. 5). Fig. 8. 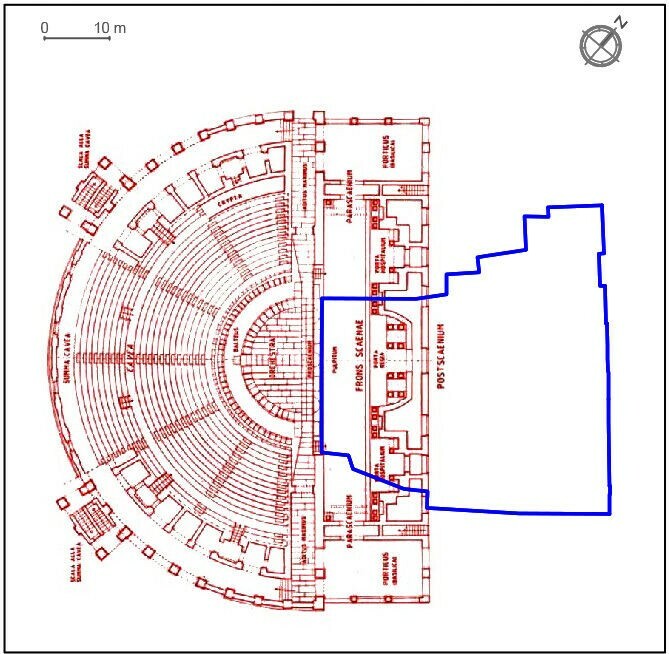 Comparative figure: a) the traced lines that intercept the area of the palace refer to the hypothetical edge of the stage and the back wall of the backstage (developed by Musmeci 1997, 35, fig. 29; Ortalli 1995, 514, fig. 19); b) the coeval theater of Ferento (Viterbo, VT). Fig. 7. Palazzo Lettimi. Survey of the portal located overlooking the street. Fig. 6. Palazzo Lettimi. 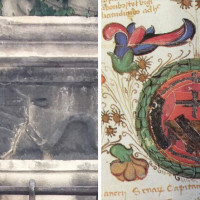 On the left the crest identified in the frieze of a window in the palace; to the right the noble crest of the Maschi family on a map from 1465 (from Mariani Canove, Meldini, Nicolini 1988,52). Fig. 5. Abacus with the local units of measure and the fixed dimensions for some building materials, 1544. Rimini, Loggia of Palazzo dell’Arengo (from Fiorini 2015, 82, fig. 6). Fig. 4. Palazzo Lettimi, front entrance (photo 27/10/2017). Fig. 3. Area of dense vegetation under which the remains of Palazzo Lettimi can be found. 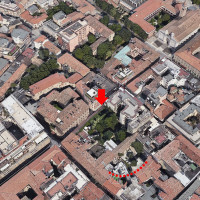 Further down: a curved line in the urban fabric due to the presence of structures pertaining to the Roman Theater (satellite image Google Earth). Fig. 19. Bridge of Augustus and Tiberius. The remains of the tower entrance (city side). Angelini, R. 1982-1983. Arco di Augusto di Rimini, Tesi di laurea, Università degli Studi di Firenze, Facoltà di Architettura, rel. G. Rocchi, A.A. 1982-1983 (https://www.prog-res.it/106/tesi-ricerche/arco-di-augusto-di-rimini.php; ultimo accesso 06/11/2018). Bondini, Anna, Marcello Cartoceti and Renata Curina, eds. 2016. Il ponte e le sue pietre. 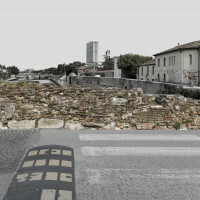 Un contributo al patrimonio culturale della città di Rimini attraverso la salvaguardia di uno dei suoi simboli più importanti: il Ponte di Augusto e Tiberio: Rimini. Bonetto. Jacopo. 2015. “Diffusione ed uso del mattone cotto nella Cisalpina romana tra ellenizzazione e romanizzazione”. 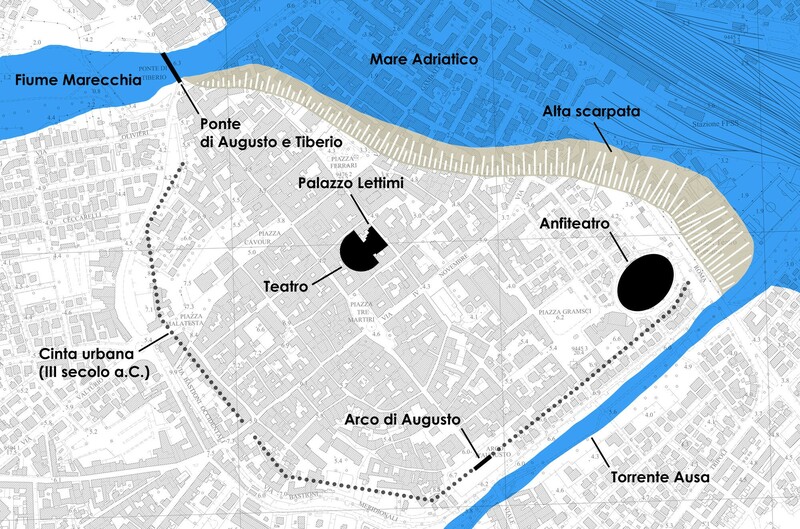 Archeologia dell’Architettura 20: 105-113. Boschi, Federica, ed. 2016. Looking to the Future, Caring for the Past. Preventive Archaeology in Theory and Practice, Bologna: Ante Quem. 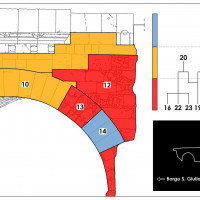 Boschi, Federica, Enrico Giorgi and Michele Silani, “Recontructing the ancient urban landscape in a long-lived city: the project Asculum between research, territorial planning and preventative archaeology”. Archeologia e Calcolatori. 28.2: 301-309. Brigliadori, Piergiorgio, ed. 2006. Il Seicento in Romagna. Cassi Ramelli, Antonio. 1964. Dalle caverne ai rifugi blindati. Trenta secoli di architettura militare. Milano: Nuova Accademia Editrice. Cirelli, Enrico. 2008, Ravenna: archeologia di una città. Firenze: All’Insegna del Giglio. Cremonini, Stefano. 1995. “Per un profilo delle problematiche geostoriche riminesi”. in Pro poplo Arimenese, edited by Alda Calbi and Giancarlo Susini, 253-328. Faenza: Fratelli Lega Editori. Delucca, Oreste. 1996. “A proposito di Palazzo Maschi in Rimini”. Romagna arte e Storia 16. Fiorini, Andrea. 2016. “Archaeology of Standing Buildings: teaching and scientific activities”. Groma 1: 40-51 (http://groma.unibo.it/fiorini_teaching_activities; ultimo accesso 07/10/2016). Fiorini, Andrea. 2015. “Modani e campioni mensori: verso un censimento dell’Italia centro-settentrionale (secoli XIII-XVIII)”. Debates de Arqueología Medieval 5: 69-90. Foschi, Pier Luigi. 2014. “Il ponte di Rimini. Gli ultimi restauri della pavimentazione”. Ariminum 2: 40-41. Giorgi, Enrico, editor 2009. In profondità senza scavare. Metodologie di indagine non invasiva e diagnostica per l’archeologia. Bologna: BradipUS. Giorgi, Enrico and Michele Silani. 2016. “Retracing Ancient Roads: Reconaissance and Three Dimensional Topographic Surveys in the Via Salaria Project”. Quaderni dei Careggi 4: 171-179. Gobbi, Grazia and Paolo Sica. 1982. Le città nella storia. Rimini. Roma-Bari: Laterza. Leoni, N. 2016. “Mensiocronologia dei laterizi nel centro storico di Rimini: prime analisi”. Archeologia dell’Architettura 21: 137-151. Manzelli, Valentina. 2001. “Le mura di Ravenna repubblicana”. in Fortificazioni antiche in Italia. Età repubblicana, edited by Lorenzo Quilici and Stefanella Quilici Gigli, 7-24. Roma: L’Erma di Bretschneider. Mariani Canova, Giordana, Piero Meldini and Simonetta Nicolini. 1988. I codici miniati della Gambalunghiana di Rimini. Milano: Motta Edizioni. Martinelli, Agostino. 1681. 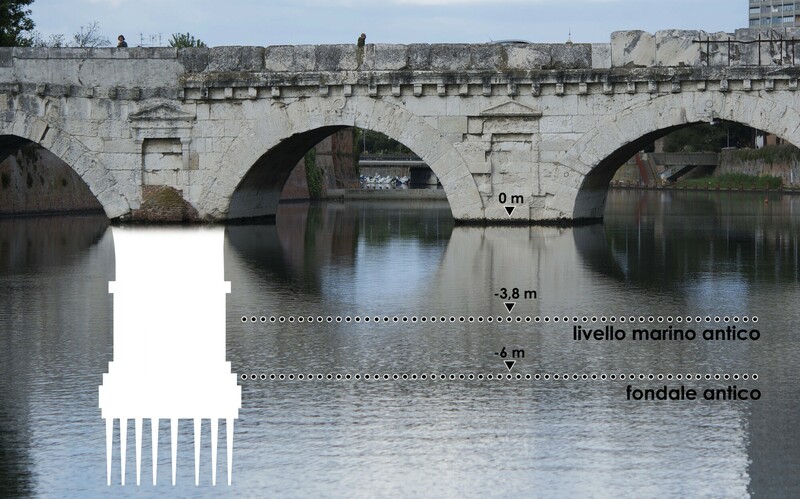 Notitie, e delineatione del famoso ponte d’Ottauiano Augusto nella città di Rimini […]. Roma. Le mura di Ariminum in Palazzo Agolanti-Pedrocca. Indagine archeologica e restauro architettonico. 2013. Bologna: Minerva Edizioni. Musmeci, Marco. 1997. Una dimora patrizia del XVI secolo a Rimini. Palazzo Maschi-Marcheselli-Lettimi. Cesena: il Ponte Vecchio. Ortalli, Jacopo. 2013. “La città romana”. 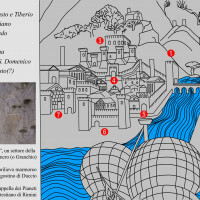 in Guida catalogo della Sezione archeologica e della Domus del Chirurgo. Rimini Museo della Città, edited by A. Fontemaggi and O. Piolanti, 27-54. Rimini. Ortalli, Jacopo. 1998. “Colonia Augusta Ariminensis. Il volto della città al tempo di Augusto”. in L’Arco d’Augusto. Significati e vicende di un grande segno urbano, edited by Pier Luigi Foschi and Pier Giorgio Pasini, 15-25. Rimini. Ortalli, Jacopo. 1995. “Nuove fonti archeologiche per Ariminum: monumenti, opere pubbliche e assetto urbanistico tra la fondazione coloniale ed il Principato di Augusto”. in Pro poplo Arimenese, edited by Alda Calbi and Giancarlo Susini, 469-529. Faenza: Fratelli Lega Editori. Ortalli, Jacopo. 1990. “I monumenti romani”. in Storia illustrata di Rimini I, edited by Piero Meldini and Angelo Turchini, 49-64. Milano: Nuova Editoriale AIEP. Pensabene, Patrizio. 1989. Il teatro romano di Ferento. Architettura e decorazione scultorea, Roma: L’Erma di Bretschneider. Procopio di Cesare, Le guerre. Persiana, Vandalica, Gotica, cura di M.Craveri, Torino 1977. Silani, Micele. 2017a. “I prodotti del nostro lavoro. The outcomes of our work”. in Pompei Intra-Extra. Archeologi dell’Università di Bologna a Pompei. Archeologist from the University of Bologna at Pompeii, edited by Giuseppe Sassatelli and Enrico Giorgi, 23-36. Bologna: BUP. Silani, Michele. 2017b. Città e territorio: la formazione della città romana nell’ager Gallicus, Bologna: BUP. Silani, Michele, Federica Boschi, Enrico Giorgi, Gabriele Bitelli and Alberta Martellone. 2017. “Seeing into the past: integrating 3D documentation and non-invasive prospecting methods for the analysis, understanding and reconstruction of the ancient Pompeii. The case of the House of Obellio Firmo (IX, 14)”. Archeologia e Calcolatori 28.2: 361-367. M. Serpieri, Rilevamento fotogrammetrico digitale non convenzionale ed analisi strutturale agli elementi finiti dell’Arco d’Augusto di Rimini, Tesi di laurea in Fotogrammetria L, Università di Bologna, Facoltà di Ingegneria, rel. A. Zanutta, A.A. 2004-2005. Tonini, Luigi. 1864. Guida del forestiere nella città di Rimini. Rimini: Malvolti ed Ercolani. Tonini, Luigi. 1848-1888. Storia civile e sacra riminese I-VI. Rimini. Verzár-Bass, Monika. 1990. “I teatri dell’Italia settentrionale”. in La città nell’Italia settentrionale in età romana. Morfologie, strutture e funzionamento dei centri urbani delle regiones X e XI, Atti del convegno di Trieste (13-15 marzo 1987), 411-440. Roma: École Française de Rome. Vitti, M. 2010. “Provincia Macedonia: materiali e tecniche costruttive in età romana”, in Arquelogìa de la Constricciòn II. Los procesosconstructivos en elmundo romano: Italia y provinciasorientales, edited by Stefano Camporeale, Helene Dessales and Antonio Pizzo. Anejos de Archivio Espanol de Arquelogìa 57. Madrid-Mérida: 327-335. Zavatta, Giulio. 2004. 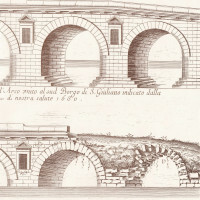 “Un disegno di Antonio da Sangallo il giovane del Ponte e dell’Arco d’Augusto di Rimini”. Romagna Arte e Storia 71: 95-104. Zuffa, Mario. 1982. Scritti di archeologia, Roma. Zuffa, Mario. 1962. “Nuove scoperte di archeologia riminese”. Studi Romagnoli 13: 85-132. 1. Giorgi 2009; Boschi 2016; Fiorini 2016; Giorgi, Silani 2016; Boschi, Giorgi, Silani 2017; Silani 2017a. 2. Ortalli 1998 (Arch of Augustus); Ortalli 1995, 513-515; Zuffa 1962, 121(Theater); Bondini, Cartoceti, Curina 2016, 14 (Bridge of Augustus and Tiberius); Gobbi, Sica 1982, 22; Ortalli 2013, 39; Zuffa 1982, 230-232 (Amphitheater). 3. Delucca 1996; Musmeci 1997. 4. Delucca 1996, 6, 17 note 47; Musmeci 1997, 36. 6. Zuffa 1962, 117-121; Ortalli 1995, 513-515; Verzár-Bass 1990, 413-414. 7. Zuffa 1982, 441, fig. 3; Ortalli 1990, 52-56; Ortalli 1998, 98; Ortalli 2013, 33. 8. Foschi 2014, 40; Tonini, 1848-1888, III, 199. 11. Ortalli 1995, 471-480; Silani 2017b, 32. 13. Bonetto 2015, 105; Cagnana 2000, 106-107; Manzelli 2001, 13; Vitti 2010, 334. 15. Gobbi, Sica 1982, 16; Ortalli 1990, 52 fig. 4; 56; Serpieri 2005, 61, 123, 138, 156. 16. Bondini, Cartoceti, Curina 2016, 16; Ortalli 1998, 18-19. 20. Martinelli 1681; Brigliadori 2006, document n° 98; Bondini, Cartoceti, Curina 2016, 54-66. 21. Gobbi, Sica 1982, 22; Ortalli 2013, 39; Zuffa 1982, 230-232. This article has undergone a double-blind review process to provide anonymity for both authors and reviewers. 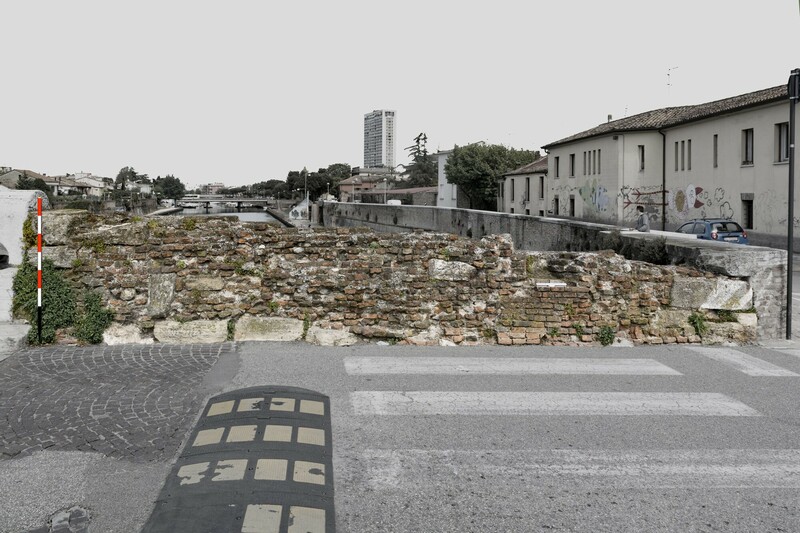 Andrea Fiorini 2018, ‘An Urban Archeological Project in Rimini. Preliminary Report (2017-2018). The Contribution of Building Archaeology to Research and Conservation’, in Groma 3. doi: 10.12977/groma18.